Keen to visit one of our campuses? the campus you'd like to visit. Join us as we journey through the week leading up to Jesus' death and resurrection. We start on Palm Sunday at regular service times. Monday through to Sunday we will be sharing daily devotional videos through our e-update (sign up here) and on Facebook. On Maundy Thursday we are meeting at each campus, at 19:00, for a contemplative communion service. On Good Friday we meet at sunrise to pause and mark the moments of Jesus' crucifixion. The sunrise service will happen at Grace uMhlanga and Ballito, at 06:00. Then on Easter Sunday we gather at regular service times to celebrate the resurrection of Christ. Join us on this Holy Week journey - a week where we give thanks for what Jesus did for all people. 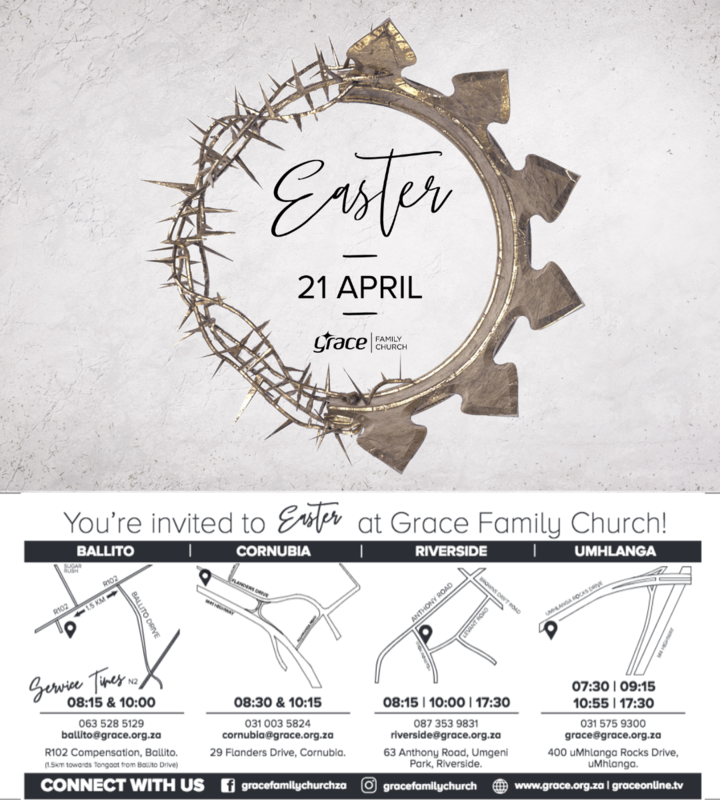 DOWNLOAD AN INVITE HERE - Share with friends and family. Register today for this 6 week journey to financial peace. Dave Ramsey and his team of financial experts will teach you how to beat debt and build wealth with the most powerful tool there is...your income! Financial Peace University is a 6 week course that will help you take control of your money, plan for your future and transform your life. Sign up for this life-changing course today! For more information you can chat to your GroupLife Pastor. CLICK HERE for registration info and FAQs. Missed Sunday's message, or want to listen to a past message? Click on the campus below to find sermons online. Here at Grace Family Church we believe that life is done best in community. GroupLife is a place to belong, whether you meet in someone’s home, at a coffee shop, or on the promenade for a walk. We understand that life is busy and there isn’t always time to connect, so GroupLife is a space for you to meet with others and grow in friendship and faith. GroupLife at Grace brings people together, as we grow closer to God, each other, and understanding our divine purpose. Want to join a group at Grace? Click the button below to find a place to belong. This will take you to our GroupLife directory where you can search for the group that suits you best. If you haven't found what you are looking for, CLICK HERE to get in touch. Love attending Grace Family Church services but are travelling or live far away? No problem!